What is the difference between a flat, eggshell, satin, and gloss finish? These terms define the sheen level, or degree of light reflectance, of the paint. The amount of sheen found in the paint can yield different levels of durability, clean-ability, and UV protection. Below you will find a brief description of the most common sheen levels. Gloss – Sheen level with the highest degree of light reflectance. Used most often on metal work, high traffic kitchen and bathroom walls (commercial), and cabinetry, banisters, trim, and furniture where a very glossy sheen is desired. Provides high durability, high clean-ability, and high UV protection. Difficult to touch-up. Semi-gloss – Below gloss in degree of light reflectance. Used most often in high traffic areas of a household like kitchen and bathroom walls, hallways, children’s rooms, playrooms, doors, woodwork and trim. Provides high durability, high clean-ability, and high UV protection. Difficult to touch-up. Satin – Below semi-gloss in degree of light reflectance. Used most often on all interior walls and nearly every single exterior project we paint on the body and trim. Provides slightly lower levels of clean-ability than semi-gloss products but similar characteristics for durability and UV protection. Helps prevent exteriors from fading, without creating a mirror-like reflection. Can be difficult to touch-up depending on how long ago the surface was painted. Eggshell or Low Luster – Interior only. Used most often on interior walls where a lower degree of light reflectance is desired. Provides slightly lower levels of clean-ability, durability, and UV protection than satin products. Greater ease in touching-up areas. Flat – Lowest degree of light reflectance. Used most often on exterior walls or interior ceilings. Generally has the lowest levels of durability, clean-ability, and UV protection. However, products are available with higher levels for interior use if flat sheen is desired. Easy to touch-up. Ceiling patches and texture matching is especially challenging. In many cases the hole needs to be "floated" out over a much larger area to make the drywall patch disappear. Floating refers to the process of covering the hole with drywall mud using a blade or trowel. This is not exactly a fast patch service. These drywall patches take a bit more time. Another thing to consider is how the hole was created? Did you move a light or was there a moisture issue somewhere that caused this damage? Addressing the cause of the problem must be the first step before addressing the visual, cosmetic issue. When it comes to painting over a drywall patch on your ceiling, always repaint the entire ceiling, not just the areas repaired. Using a flat sheen paint on your ceiling can further assist hiding a noticeable ceiling patch. This is a true science and art form. The science comes when you measure out specific levels of water to add to the drywall mud to create the specific texture pattern. Tests have to be performed to ensure things will look correct before actually applying to the wall or ceiling patch. In many cases, on older painted walls, the texture has to be layered in order to match the existing wall texture. The process of prepping the wall, knowing when to prime and with which primers is also really important. The art form comes in the spray application. Without a highly skilled and experienced hand behind the trigger, your drywall repair project may look worse than it did as a little hole in the drywall. Our Patch and Paint team has all the pieces needed to patch and repair your drywall holes, match the drywall texture with precision, and then paint those areas to fully complete the project. Yes we do! We can repair even the most challenging drywall repairs in your home or workplace. Our drywall specialist is an expert at matching texture and making those drywall holes history! Our fast patch drywall service will clean up your home and office in a flash. Call now to schedule our Patch and Paint service. In most cases, no bid meeting is needed to get started. For pricing information please give us a call. 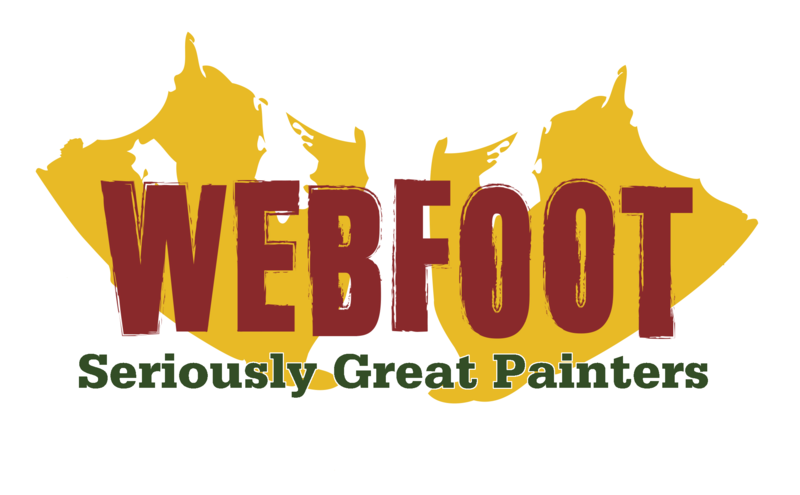 For more information on Webfoot's Patch and Paint service click here. A "repaint" is simply every paint job after the first "new construction" paint job. Within the painting industry there are almost two different types of paint contractors- those that do new construction, and those that do repaints. And there's a big difference between the two. Take the exterior of a newly built home. There is typically no landscaping, no end user of the home around, no pets or children running around, little concern for quality, no prep work besides possible washing of the home, and it is typically painted in a single day with one coat on all surfaces. Compare that to a "repaint" where there is typically a great deal of prep work (sanding, caulking, priming), lots of landscaping to protect, typically kids and pets running around, a homeowner is onsite and concerned with the lasting quality of the work, and it is painted over 3-5 days with two coats on all surfaces. That's a big difference! 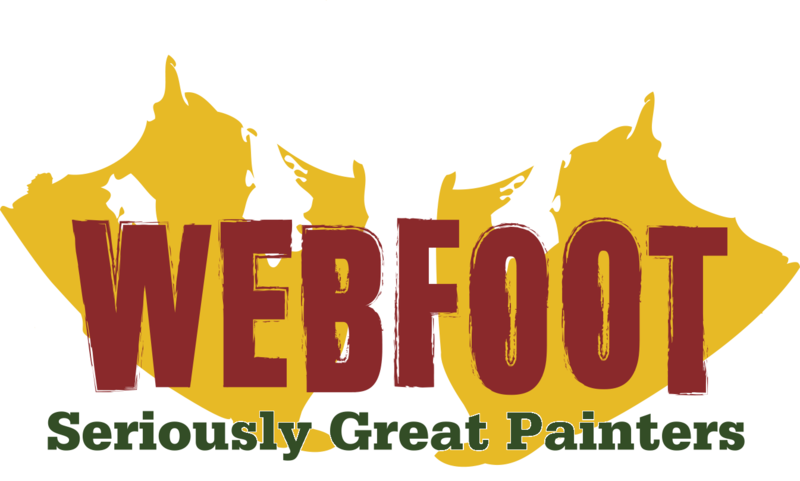 From the beginning, Webfoot Painting has been a repaint company. We love taking a home or commercial building that has weathered one too many seasons and tackling all areas of needed prep and creating a beautiful paint job that's going to last years longer than the first new construction paint job. Yes, a lot of them! We've refinished decks from small 200 sq.ft. front patios, to massive 2500 sq.ft. outdoor living spaces. A lot of companies out there think pressure washing, chemical strippers, and chemical brighteners are the way to go, but we strongly disagree. Not only are these processes hard on a deck, but they are also pretty hard on the environment, not to mention all the water that gets wasted through 4-6 stages of washing. When pressure washers are used for removing gray, discolored areas of decks, the soft wood particles between the grain gets washed away and what's left is a ribbed, splintered deck. Watch out for slivers... We skip that process and go straight to sanding. We start by resetting all your deck screws and then use industrial sanders to bring your deck back to a like-new condition. Detail sanders work around all the edges and steps so all surfaces look even before staining. The next steps get into trade secret territory, but the end result is a gorgeous deck fit for entertaining, free of splinters and those unsightly sticky areas that never seem to dry (and that like to collect dirt, pollen, pet hair, etc.). Got questions? We've got answers. Here’s a quick guide to stain maintenance. Remember no two surfaces are identical, this is just a guide. Cedar Shingles– Every 2-3 years. South and West facing walls require more frequency. Fences– Every 3-5 years depending on sun exposure and watering practices. Decks– Every 1-2 years to maintain a healthy deck and avoid costly refinishing. Garage Doors / Front Doors– Every 1-2 years to avoid discoloring and stains. Interested in a free stain maintenance consultation? Go to our request a bid page and let's setup a meeting time! Under our Stain Maintenance Program we’ll actually monitor your stained surfaces for you. We can setup a plan designed specifically for your home’s needs with clear pricing and a schedule of maintenance. Just like having someone maintain your landscaping, we'll maintain your decks, shingles, doors, and fences. Read our blog for more information on our Stain Maintenance Program. What is it about Central Oregon that is so hard on the exterior of my home? Many would say it is the intense sun exposure of the high desert, and I wouldn't argue with that. But there are other places where it is just as sunny. At Webfoot, we believe it is the extreme temperature swings that we experience that really separates us from other places. We've all seen it... 90 degrees and sunny during the day, 35 degrees and cold at night. That is a huge swing! In a 24 hour period your siding and trim has expanded with the heat, shrunk with the cold, and then re-expanded. No wonder we are seeing falling trim and siding on so many homes. We need to consider the flexibility of the products we're using. Number one: the primer. We use a product from XIM called Peel Bond. This is an exceptional primer that can prime basically any surface. What's so great about it though is it's flexibility when dry. We haven't found a primer that holds up to Central Oregon conditions better than XIM Peel Bond, that's why we use it on every single house we paint. Number two: the topcoat. We strongly recommend the use of a satin sheen paint over a flat sheen paint. This extra sheen provides greater durability, flexibility, and basically acts as a sunscreen for your house protecting the paint pigments. 99.9% of the homes we paint in Central Oregon are with satin sheen paints on all surfaces. Now some HOA do not allow satin sheen paints, this is unfortunate, but most do allow atleast a low-sheen or a matte finish. This is a sheen level between flat and satin, so you get most of the benefits of the higher sheen products. But you will want to check with your HOA first to be sure. It's not referring to the color! "Green" paint refers to the amount of VOC's (volatile organic compounds) found in the product and the exclusion of certain toxic chemicals. It also means that the product's manufacturing process does not involve toxic off gassing or other environmentally harmful processes. For consumers, the use of green products means improved indoor air quality and the assurance that your project is not harmful to the environment. An easy way to identify green products is by checking for independent agency classifications. The two major agencies that classify green paint products are Green Seal (GS) and LEED. GS or LEED certified products may be the easiest to identify, however several un-certified paint products exist that also meet or exceed these standards. In fact, some of the best green products for durability, and color retention clearly exceed these guidelines but lack current certifications. With so many paints claiming to be “green” it can be difficult selecting the products that give you the durability and color you desire, while maintaining low VOC levels. It is important to keep in mind, once making the commitment to use green products that looking after the Earth’s needs doesn’t necessarily mean having to ignore yours.This is where the knowledge and experience of Webfoot Painting is critical. We keep up on all the latest green products and we know when and where it is appropriate to use them. By choosing to go green with your project, together we can do our part to minimize our environmental impact on beautiful Central Oregon. Yes, we are active members in the Bend Chambers of Commerce, members of the High Desert Design Council, as well as members of the Painting & Decorating Contractors of America (PDCA). With many contractors this is a common occurrence. But with Webfoot the price we quote you will not change unless you change the scope of the job. Meaning, if you decide to have an additional wall painted, have some shutters painted, or decide you want your shed painted as well, that would change the scope of the project and a new assessment would then be made. Other than those type of situations the bid we quote you will not change. Does Webfoot Painting do interior painting as well? We can paint ceilngs and walls all throughout the house and also offer full trim packages (including doors, window sills, and floor trim), cabinetry finishing, and wall work/repair using both paint and interior stains. Check out our Interior Painting Prep and our Interior Painting sections for more information. Why is my paint fading/discolored? The intense sun exposure Central Oregon homes receive is the main reason for paint fading. This is seen predominantly on the western and southern exposures and most noticeable with darker colors. Every home in Central Oregon is affected by this first problem. Latex paint comes in several different sheens. The more sheen a paint has the more latex it contains. The latex acts like glue in the paint and it serves to both form a protective coating over the paint’s pigment and reflect radiation from the sun. Flat paints are low sheen leaving the pigment more exposed to the sun which causes the paint to fade more rapidly. A satin sheen will drastically reduce fading and is highly recommended when using darker colors. All too often new homes come with only a single coat of exterior paint. The problem with a single coat is that the dry new siding will absorb the first coat too quickly. The latex in the paint, which protects the pigment, gets absorbed into the siding quickly while the pigment in the paint is left “out in the rain” so to say. This is called a “color coat” and looks fine on final inspection of your new home but will reveal itself within the first few years. How can I fix my peeling trim? Homeowners often try to fix this problem by adding layers and layers of paint onto their cedar trim boards. If you have read the reasons for your failing trim in the section above you should understand that adding more paint won’t solve your problem. In the short term it will be hidden, but each time you add another layer the paint will fail sooner. To truly fix the problem we need to pressure wash, scrape, and sand our way down to that original bare surface. After which a quality primer and two coats of paint are applied. Without adequate prep you can expect to have to repaint your trim about every other year! By paying more to have it done right the first time, you will actually save money over going with a cheaper painter and having to paint every two to three years. Our detailed prep process gets to the root of the problems, rather than just covering up the symptoms. My home appears dry and paint is cracking off, what can I do? It’s time to call Webfoot to have your home prepped and painted. If your home appears dry and/or paint is chipping off it is probably over due for a paint job. Think back to how many years ago you last had it painted and if it is over 5-6 years ago, it’s time. But what if it has only been 2-3 years since the last paint job? If this is the case, read through the rest of our FAQ page of our website to help understand possible causes. And if you still have questions, then please give us a call or request a bid online and we’ll come take a look at your home personally! Why is my trim (window trim, corner boards, facias, finger joints) peeling and flaking? In most cases, it’s the primer! This problem is seen very often in homes built within the last 5 years. Builders choose to use trim that comes pre-primed to save time and money. The first problem is that pre-primed trim boards are often primed using fast drying oil--based primers that become very brittle due to their rapid cure rates. The second problem is that these primers are designed to be painted over within a few weeks of exposure, and how often do you see a home built and then painted within a couple weeks? In reality most are left exposed for months when you consider the time spent between the mill, on site construction, and final painting. The third problem is the use of cheap lumber that has a high shrink rate, meaning that it will shrink, warp, or shift over the first few years. The outcome is overexposed brittle primer chipping off and taking the paint with it as new homes settle and the trim boards shrink. Check out how we recommend handling these issues in our Exterior Paint Prep section. It’s all about the surface.